I'm awake at 1am again, damn it just like last Monday. I really need more sleep. Cyclocross races only last less than an hour, why is this all so tiring? Let's recap. So last weekend was a double with a Central League race on the Saturday and then the Inter Area Champs in Chesterfield the following day. 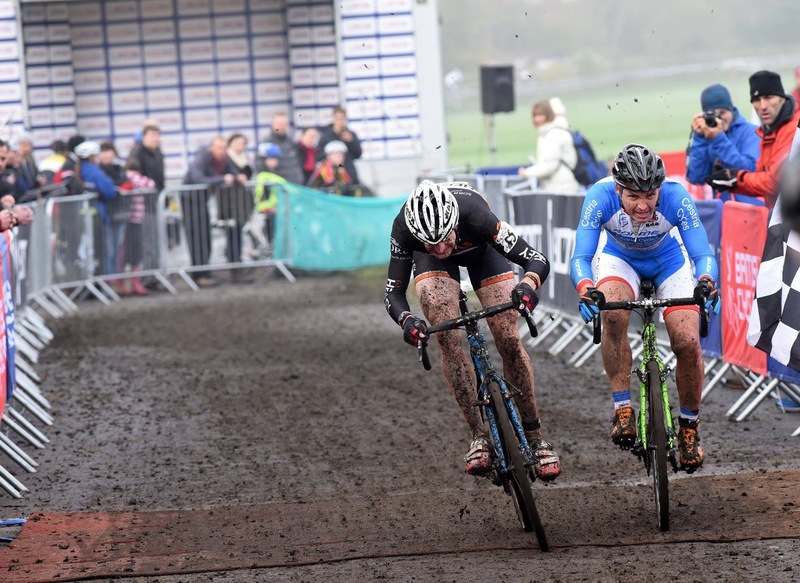 This weekend a (different) league race and then the next round of the National Trophy in Durham. In the week between it’s really essential to train hard, if you use this time to ease up for the following weekends races you would never really improve. It’s those super hard sessions during the week that bring you on and raise the fitness levels. Last week went really quick, most of Monday was spent cleaning bikes, kit and van. The mud in Chesterfield got everywhere (half lap bikes changes it was so clingy) and in a bid to get on the motorway sooner rather than later I just threw the muddy bikes in the back of the van. Unfortunately this just got mud everywhere and made the clean-up process so much more work once home. Then it was a case of getting on with my specific sessions. Two full bore reps per week has been my training staple for many years through many sports. Tear yourself up in training is the sure fire way to improve. Of course I am forgetting to mention real life here as there is a week's proper work to do aswell. The week went all too quickly, and it was soon time to load up the van again on Friday morning and head off for Durham. We’d planned to leave at 10am to avoid the Friday afternoon traffic. As always things got delayed. I discovered some last minute bike issues that needed resolving. It was 2pm when we finally left town. The next five hours were spent in traffic and when we passed the exit for Chesterfield (with still 130miles to go) we had had enough. The lure of the hotel we were at last weekend in Chesterfield was too much, so we left the car park that was the M1 and called it a night. So the next morning was an early start to finish off the journey up to Durham. My first race of the weekend was a North East League at the same venue as the following day’s trophy. Good practice to learn the course. I did ask if I could be gridded and the commissaire said I could be on the 3rd row and my name was written on the list. I was happy with that. After all I am not part of the league but my National Ranking points did count for something. However the same commissaire then used a different list at the start line and my name was not called. So near the back I had a sea of riders to try and get past. I decided to race hard for the first half and then ease off to save energy for the main race the following day. I didn’t really end up getting an easy race as I skidded and fell heavily on the tarmac early on. My knee, hip and elbow took quite a scrapping. I ended up 5th and learnt a lot about the course, so was reasonably ok with that. It had been pretty muddy and slippery, so again there was plenty to do afterwards to prepare the bikes for the following day. Stupidly I decided to tinker with my brakes which were not 100%. My handy work quickly caused more problems and I ended up needing a new brake cable. Scott were sponsoring the weekend and a nice chap called Jamie said he would repair my bike in the morning. Relieved that the problem would be sorted we headed for the hotel. Conveniently we were staying just 400m from the course tonight, however this hotel was going to regret not having an outside tap, we needed to re stock on water for jet washing tomorrow. So I traipsed my muddy containers through reception and refiled them in the bath as I washed up and tended to my cuts and scrapes. It was at this point we started to notice the smell. Not from us, although I had already trashed not only the bathroom but the bed with muddy kit. No the smell was coming from the hallway. It turns out the hotel had recently had a flood through 3 floors on one side of the hotel. The smell from the damp and the cleaning products was not nice. So now I’d trashed the room a bit we decided to move. Luckily reception was obliging and we were shown another room. However as we walked in the concierge said they had not been able to use this room for the past 4 days, as the last guests had cooked a curry in it! We walked in, not great, again smelly. So it was at this point I gave him a 'I demand to be upgraded' look. It worked, as we were soon escorted away from the smelly side of the hotel to the posh non smelling section. As we entered the now rather large room he said, ''I do have to warn you about something though''. Here we go what's wrong with this one, it looks great (we were clearly now a few rungs up from what we had paid for). ''There will be an armed robbery at the bank opposite at 9am tomorrow'' he then paused before adding ''it's for a tv film''. The night was interrupted a few times not by gun fire but the lack of skin on my elbow and knee meant I was sticking to the bed sheets, nice! Sadly in the morning we had to miss the planned armed robbery as we had to get to the course to get my bike ready for action. So for the main event of the weekend, round 3 of the National Trophy. A visit to the friendly Scott tent soon had my bike 100% and ready to play. This time I was determined to get a good start. Surprisingly I get to the first corner in the lead and for a while I am battling for a place on the podium. A slight error of judgement on lap two and I was off into a barrier. My bars seemed to take an age to firstly extract themselves from the barrier and then pull away from the tape that had wrapped around me and the bike. Lastly before I could get off again I needed to straighten my front wheel which was now at a rather useless angle to the bars. Winded I tried to get back up to speed but not before swapping bikes, Davina (6 months pregnant) luckily had some help today from Chris Sumner (Beeline Cycles) in the pits. We also were fourtune enough to be able to borrow Steve Davies's (Hargroves Cycles) jet washer as ours had packed up the day before. I tell you, you get nowhere without friends in this sport. In the second half of the race I had a great tussle with Andy Peace and David Hopper. A real lung busting effort but my recce of yesterday really helped and I was throwing the bike around the slippery corners well, (apart from the one aforementioned off). So another clean-up begins and the long drive home. By the evening I’m wasted. I crash out in bed, hoping for a much needed rest. My legs on the other hand had other ideas, and for the second Monday morning in a row I'm awake from 1am. Legs aching so much sleep not currently allowed. And so another week begins, luckily though there's less muddy gear compared to last week to sort through. I think I'll write this week’s training schedule now, super tough of course, but maybe I'll try and crowbar in some recovery in this time. Just for once.